If you have a lawn, I’m sure you have worked through some grass care problems. You are not alone. Lawns will always be a work in progress. Nature doesn’t make beautiful lawns. A nice lawn is a planned process from start to finish. We owe a lot to the home grass care and professional turf maintenance industry. Turf managers have invested hours in refining their methods and improving turf quality. There are also agricultural universities around the country that have thousands of grass plots sectioned off for grass care for conducting research and for experimenting with new grass species. Natural organics have come a long way. Understanding how to build the soil for better plant production has taken front stage over what I have seen as "gimmicks" and half truths in organics. All natural biostimulants are an example. In 2012 was the first World Congress on Plant Biostimulants held in France that brought researchers, businessmen, and farmers from all corners of the world. Interested in seeing an example of how organic approaches are changing the world? Even deserts are being changed. Check out this video by John D. Liu. It is 47 minutes long, but the ideas are priceless. The philosophy is solid and we promote and encourage these ideas. As the video above demonstrates, it's all types of green plants, especially lawns, native grasses, and trees that will restore ruined landscapes and problems soils. Lawn Care Academy is evolving as well and we give more favor to organics that actually work. An area of grass measuring 5000 sq. ft. in size produces as much oxygen as two 100 ft trees. That is roughly the size of an average front yard. An area of grass 650 sq. ft. in size can provide the daily oxygen needs for one adult. In the process of gas exchange, lawn grasses absorb large quantities of carbon dioxide from the air each day. Grass has an air conditioning effect on the environment. Roadways and sidewalks can heat up in excess of 100 degrees while the adjacent grass will be cooler by at least 25 to 50 percent. A major complaint about artificial turf is that it absorbs heat. The temperature on these fields will often be 25 percent hotter than the air temperature in the stands. As a result, players have played in heat well into the 100s. Injuries also increase on artificial turf. Many stadiums have removed the artificial turf and replaced it with grass. The result: cooler fields, happier players and less injuries. Performing good turf maintenance practices benefits us in many ways. A good covering of grass helps protect soil from erosion by holding it together through a complex network of roots. A good stand of grass slows the flow of water, giving it time to be absorbed and helping to recharge the water table. It also shades the soil and slows evaporation. Lawn grass is a big part of nature’s air and water filtration system. Every year, enormous quantities of dust, pollution and harmful gases are trapped and filtered out by grass blades and roots. A well cared for lawn can greatly increase a home’s value. This is a well documented observation. A healthy, manicured lawn always adds a sense of increased value to the property. Plants also add a sense of peace in a fast paced world. 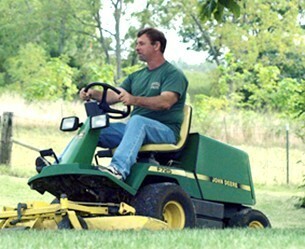 Many have found relaxation in garden and lawn care. Experiments on the calming affect of plants were done on Russian Cosmonauts while in space. An area was built for green plants to be grown on board the space station. The scientists, back on earth, notice that the Cosmonauts showed reduced stress and their center of social activity always occurred near the plants. In patient care studies, hospital patients who were allowed to see and touch live plants felt better, healed faster and went home sooner. Thick lawns and thick pastures are less conducive to weed growth. Poor grass care leads to problems. Many weeds are considered invasive, can attract problem insects, and are hard to control once established. Allowing invasive weeds in dominate harms the environment and is costly to remove. What does that mean? Turf maintenance and home grass care is something we cannot take for granted. We have already begun to realize how much our health depends on the greenery around us. Home lawns and gardens are not only nice to look at, but are healthy for us. It gives us a sense of tranquility and order in a troubled world. Many take it for granted, not realizing that the combined value of plants and turfgrass far exceed any time or cost we invest in maintaining it. We were created for life in a green world and we can’t live without it. Beautiful lawns consist of more than simple grass care. Many creative features can add beauty to any lawn. For help building valuable accent features such as patios, stone walls, or creative ideas, check out our friends at www.Dream-Yard.com for Landscaping, Stone Walls, Patios and more. In today's world, the environmental effects of pesticides are a concern for many of us. Fortunately, the majority of problems are not caused by homeowners. Click here for help and information on environmental safety concerns. Understanding the basic biology of grass seed germination will reinforce your knowledge of planting a lawn and help answer the “Why is it done this way?” line of questions. There are so many grasses, but they can all be divided into two categories. Find out what grass type you have and if it is the best one for your area. Need Proof of Natural Biostimulant Performance on Turf? See This Short Video! A Commercial Turfgrass Grower Demonstrats How "Turf Formula All Natural Biostimulant" Greatly Increased His Turf Quality and Profit Weeks Ahead of Schedule!